Glacial erosion can affect bedrock frost heave features such as monoliths or frost-heaved mounds when the features occur beneath moving warm-based or cold-based glacial ice. Frost heave features can be abraded, shifted or obliterated depending on the applied ice load. 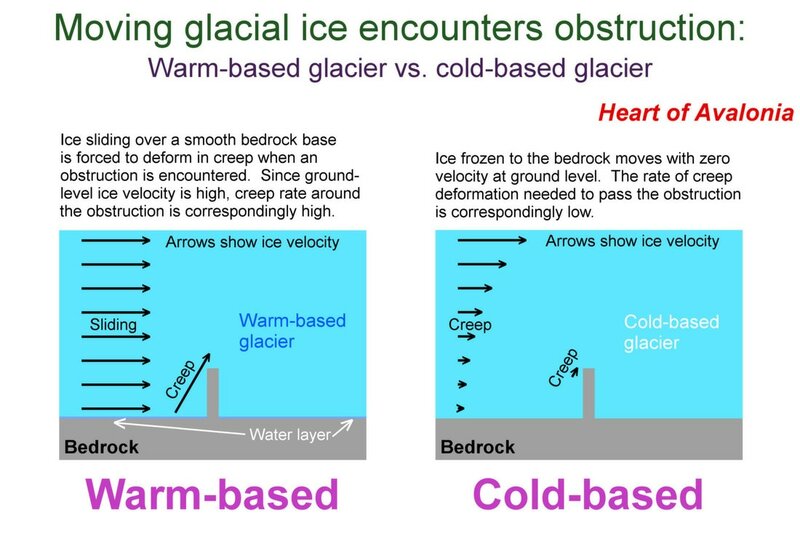 The above diagram provides a qualitative argument that warm-based basal-slip glacial activity imposes a higher ice load on an obstructing frost-heaved monolith than does cold-based creep-driven glacial activity. The primary reason for the increased ice load in a basal slip environment is the higher ground-level ice velocity accompanying basal sliding motion. When moving ice encounters an obstruction, the ice must either fracture, pressure-melt/refreeze (regelation process) or deform via creep. Fracturing of ice or cavitation implies that a maximum realizable ice load acted against the obstruction. Ice fracturing becomes less likely under thicker glaciers because elevated hydrostatic pressure inhibits cavitation and fracture development. Regelation is assumed to play a significant role when warm-based glacial ice is diverted around a large landform such as a hill, resulting in plucking. Regelation is also thought to account for ice motion around small surface obstructions during basal sliding. The regelation process is rate-limited by the necessity of transferring heat to the pressure-melt zone and removing heat from the refreeze zone. Thus, as basal sliding velocity increases, the ability of regelation to adequately relieve stress at obstructions is diminished. Creep is a term normally applied to the plastic deformation of crystalline materials whereby strain is accommodated by the movement of dislocations (see Ice Properties). Ice creep rates are highly sensitive to temperature (at temperatures near freezing) and to applied stress. Temperate glacial ice consists of an assembly of ice crystals and water inclusions along with air bubbles and other impurities. Under high deviatoric stress, the ice crystals comprising the bulk of temperate ice are disrupted by multiple processes. These processes include the creation and migration of dislocations, the shifting of crystal grain boundaries and the movement of borders between ice and impurities. When ice crystals are subject to high levels of disruption, the potential energy (electrostatic energy of interaction between adjacent molecules) of the constituent water molecules increases relative to the baseline potential energy of water molecules deep inside undisturbed ice crystals. When the energy of the water molecules in a disrupted crystal is raised sufficiently, it becomes ambiguous as to whether the crystal may be considered partially melted. This implies a transitional zone where high rates of creep (as in glacial ice diverting around a small obstruction) blend over into regelation. Cold glacial ice lacks water inclusions and deforms more in accordance with the usual definition of creep when subjected to deviatoric stress. As with temperate ice, creep rates are not linear in applied stress, but vary with a power of the stress magnitude, usually determined to be around 3, so that doubling the magnitude of the deviatoric stress causes an 8-fold increase in strain rate. The basal sliding process associated with the motion of temperate glaciers is lubricated by a layer of water between ice and underlying bedrock. Ice velocity does not decline to zero at the ice-bedrock interface. Accordingly, the basal sliding process depends strongly on the ease with which temperate ice can deform to accommodate motion around small ground-level obstructions. An isolated frost-heaved monolith 50 cm wide and standing 100 cm high would likely not meet the requirements of "smallness" needed to permit basal sliding at usual glacier flow rates. When such a feature stands in the path of ice moving "too fast" around it, the feature becomes subject to enhanced ice load. This ice load increases until the feature is fractured or dislodged. Field evidence pointing toward the conclusion that metre-scale frost-heaved joint blocks do not survive basal-slip glaciation is found in the near-complete absence of smoothed or streamlined edges on larger bedrock frost heave features. The few cases where smoothing has been noted have been on bedrock frost heave occurrences standing at most a few cm above adjacent bedrock. The flow rate for cold-based glaciers is typically much lower than for warm-based glaciers, and near ground level the flow rate over bedrock diminishes to zero. A metre-scale frost heaved monolith would be subject to ice loading by cold-based glacial flow, but if the flow (creep) rate approaching the block was low enough, it is reasonable to expect that ice could creep-deform around the block without loading the block sufficiently to fracture or dislodge it. The power law (see above) for ice creep rate dependence on stress could allow ice loading to remain below rock failure criteria, even as creep rates at a diversion substantially exceeded creep rates in the approaching and receding glacial ice. This could account for observations of frost heaved bedrock where blocks have apparently been tilted or shifted by moving glacial ice, but nevertheless have remained lodged in bedrock and not fractured or sheared off at the base. 1) The frost heave occurred post-glaciation. 2) Where evidence points to concurrent glaciation, the indication becomes that the glacial flow did not involve basal sliding and the glacier was probably cold-based.